The Dream Culture of the Neanderthals explores the influence of Neanderthal man on the cultural and biological development of humanity. It traces the power of long-held beliefs and superstitions to the influence of Neanderthal lunar and dream-based traditions. This work offers a compelling vision of a unified humanity that can benefit from the gifts of both its Neanderthal and Cro-Magnon ancestors. The Dream Culture of the Neanderthals provides evidence that direct descendants of the Neanderthal race may still be alive in Central Asia. A number of long-standing beliefs and superstitions show how the ideas that dominated the lives of our ancestors still have a powerful influence on us today. Contrary to current theories, Stan Gooch maintains that the Neanderthals were not destroyed by the younger Cro-Magnon culture but were incorporated into that culture through interbreeding. The blending of the disparate influences of the lunar, matriarchal-based Neanderthals and the solar, patriarchal Cro-Magnons may explain the contradictory impulses and influences that have generated human conflict for millennia. There is evidence that direct descendents of the moon-worshipping, dream-cultivating Neanderthal race are still living in Central Asia today. While their physical descendants may be almost extinct, the influence of Neanderthal occult wisdom remains strong and can be found throughout history among witches, kabbalists, the Knights Templar, Rosicrucians, and even in Christianity. Walker moved down the rough walls of the hillock and worked his way along a game trail. A sudden, resounding roar from a ledge above made him freeze in place. Holding his breath, he raised his eyes slowly. Overhead, a huge, slavering cat’s head peered down, its lips drawn back, revealing four-inch long, scimitar-shaped teeth. He pressed into a niche in the rock wall, screwed his eyes shut, and tried to deny the reality of his situation. Another thunderous roar confirmed its actuality. His eyes darted about wildly, searching for an escape route. The sinister, striped beige-and-white beast appeared at the bend in the path. It sniffed the air as if relishing his scent, then moved closer. Slowly, gracefully, its sinewy body wound around the curved path. Its green eyes fixed on him, it dipped, coiling into a crouch, readying to spring. A dark object shot out of a recess in the wall. The thick spear plunged into the cat’s side with such force, it was almost tipped off its feet. With a piercing screech, the cat writhed to free itself. Thick, steely arms forced it toward the edge, pushing it over the side, crashing into rocks below before it slammed to the ground. Walker released the breath he held, but his relief was short-lived. A barrel-chested figure draped in animal skins stepped into view, holding the blood-slicked, stone-tipped spear. The hulking man watched him expressionlessly. Thick, protruding brow ridges sloped back to reddish-brown hair, merging into a scraggly beard that framed his crude features. Was that a glint of intelligence in the man’s deep-set eyes? He seemed as baffled by Walker’s appearance as Walker was by his. Could he be…A Neanderthal ! The Neanderthal stretched his neck to sniff him, then tugged at his clothes. He reeked of body odor, foul breath, and sweat. Although Walker wanted to draw away from the disgusting stink, he remained still. After a long moment, he held up his palm. The Neanderthal seized his wrist in a beefy fist. Walker grimaced in pain and dropped to one knee. The man pulled him to his feet and, thankfully, released his wrist. He stared into Walker’s eyes, then slapped his great chest with his hand. “Ruh!” he exclaimed forcefully. “Ruh.” He struck his chest again. Walker was confused. He forced a smile and shook his head, trying to convey his lack of understanding. Walker nodded his understanding. He pointed to himself and said “W’gee.” Then he pointed to the man and said “Ruh.” The man dipped his head and drew his protuberant lips back into what seemed to be a smile of acknowledgement. So, your name is Ruh. Using short, shrill phrasings, Ruh pointed ahead and down, urging Walker to descend. They soon reached the bottom. Walker’s captor pushed at his back, directing him toward the dead cat. Ruh moved around the animal cautiously, poking it with the spear. Walker stopped cold. The creature’s front paws twitched in a death reflex. With a piercing scream, Ruh’s spear smashed into the animal’s skull, crushing it and showering himself and Walker with blood and blobs of brain tissue. 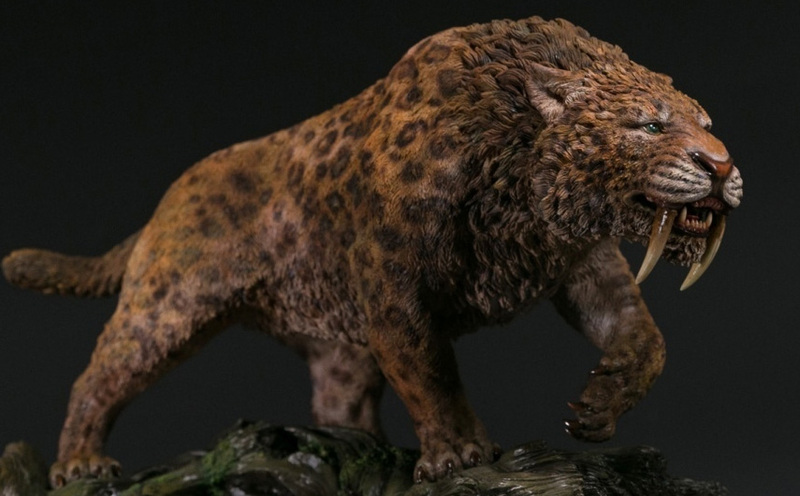 He took a finely chipped hand axe from a fur pouch at his waist and whacked at a long tooth until it broke away. With a guttural grunt, he offered the tooth to Walker. Walker smiled and accepted it, then stuffed it in his pocket. Apparently satisfied, Ruh screeched a long and short burst that sounded like a command toward a nearby thicket. Two figures appeared from behind the dense bushes and approached slowly. To Walker’s surprise, the taller one had the proportions of a modern human. Exposed, drooping breasts identified her as female. 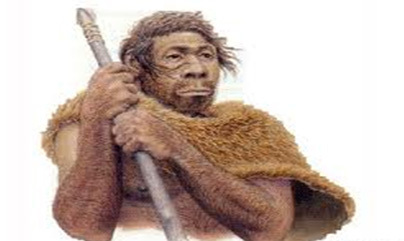 She was slightly taller than the Neanderthal, with a narrow head, lighter skin tone, and dark brown hair. Unlike the Neanderthal, her brow did not protrude and she had a conspicuous chin. She remained at a distance, kneeling, avoiding Walker’s probing eyes. A child hid behind her.